Have you looked into SlideShare? This article will give you 10 tips to maximize your leads with SlideShare. The rise of visual content marketing is forcing marketers everywhere to re-evaluate their overall strategy. No longer can a marketing professional rely solely on white papers and blog posts to get their message to prospective buyers and customers. It’s now vital to include a visual element across all marketing campaigns. SlideShare is an essential part of any successful content marketing strategy for many businesses. It’s much more than just a place to upload your webinar slides, it’s a powerful social community with a reported 60 million monthly visitors. Anyone can view presentations and documents on topics that interest them and download and reuse or remix material for their own work. Here are 10 tips that can help you take advantage of this trend in visual marketing and turn SlideShare into a lead generating machine for your business. The goal of content is to establish yourself as an expert in your field. 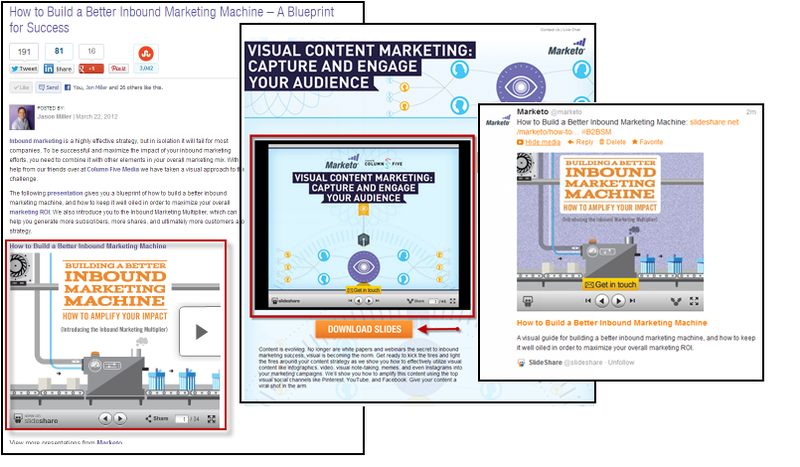 SlideShare empowers the modern marketer to do this using a highly consumable visual element. The idea here is to focus on creating SlideShare content that is relevant to your target audience. But you should also try to push the boundaries a bit. Look for new content topics that you can tie back to your expertise. This is a great way to broaden the reach of your content and pull in new prospects on their journey to finding a solution to their problem. Below is a great example of this from mobile app developer Kinvey. Keep your SlideShare presentations in line with the audience you are trying to reach, while opening it up to new audiences. 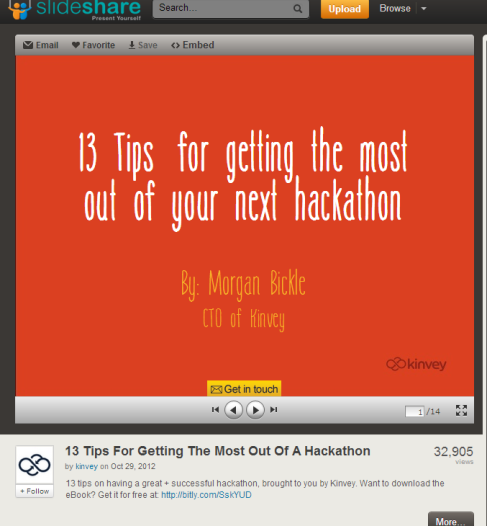 Of course Kinvey has SlideShare content around their core topic of mobile apps. But they also create content that pushes beyond their initial audience, and this greatly expands their overall reach on SlideShare. Just as with any form of content marketing, you have only a brief moment to catch someone’s attention in the insanely fast-paced world of social. Make sure the first slide of your presentation is easy to read and well-designed. Doing so will give your SlideShare presentation a much better chance of garnering views, as the topic is now reinforced as your title slide. Pull in readers with the headline and keep them clicking through with the content. Make sure your headlines grab attention. In some cases, creating presentations that rank for certain keywords can be much easier to get than a good ranking for a post on your blog. It’s important to include keyword-rich titles, descriptions and tags to give your presentations a fighting chance in the world of search engines, as well as inside the SlideShare search results. Make sure to include keyword-rich titles and descriptions to help your presentations rank higher in search. Make sure you spend time writing strong titles and descriptions with these search engine optimization factors in mind. 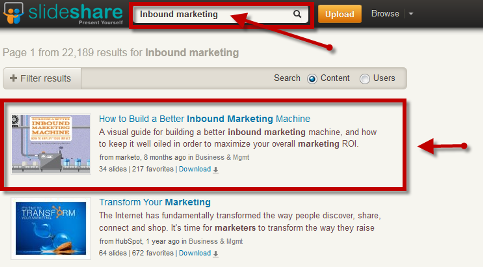 The fact that your SlideShare presentation is easily embedded into other sites also drives SEO results. Each time someone embeds your presentation it serves as an inbound link. SlideShare is especially useful across the social sphere because it renders easily within a blog, landing page and Twitter. This allows you to keep your audience engaged without having to leave their platform of choice for consuming your content. One presentation can be the core content piece to an entire campaign as seen below. SlideShare presentations are easily embedded on blogs and landing pages and they are viewable within Twitter. In this example, the SlideShare presentation has been integrated and embedded across a company blog, a specific landing page and social platforms. You’ll want to make sure you embed your SlideShare presentations across multiple platforms to get the most out of your visual marketing. Making an initial splash and gaining traction with a new presentation on SlideShare can be challenging. Make sure you have a promotion strategy in place before you upload. Doing so will give you a much better chance for making the coveted front page of SlideShare and gaining “Hot on…” status. The more shares your presentation receives at a given time, the more likely it is to showcase on the main page of SlideShare. Before you push that Publish button, check with the rest of your marketing team to see if there is any way they can utilize your presentation in their campaigns. Look for all of the opportunities available to you to promote your SlideShare presentation as it publishes. Then make sure you have a social plan to drive shares and likes in order to make the biggest impact possible upon posting. As with any solid piece of content you create, it’s important to have a plan in place to make sure you get the most out of your content. This is especially important with SlideShare, since there are many opportunities to use your presentation and draw visibility to it, both on- and offline. 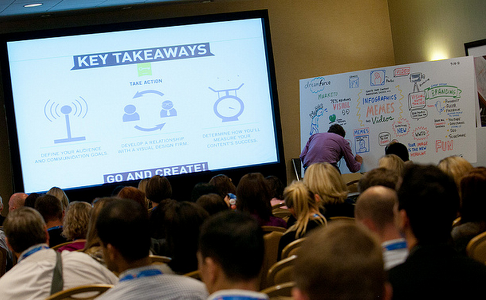 Presenting a custom SlideShare deck at an industry conference can greatly expand your reach. 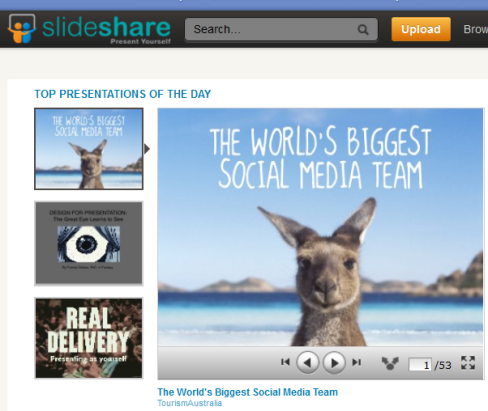 One great SlideShare presentation can be the star attraction in more places than one. Make your presentation part of something bigger by showcasing it at company meetings, user groups, social meetups, industry conferences and use it in a webinar or two. Chances are you already have white papers and/or case studies that can be repurposed into visual presentations. This is a great opportunity to turn this content into a visual SlideShare presentation. 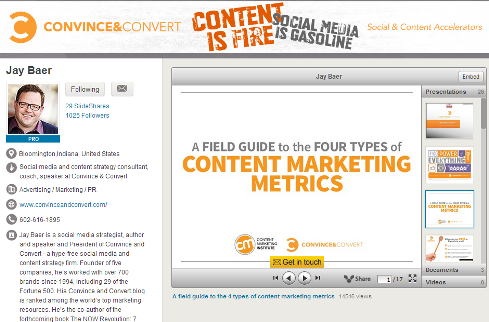 In the example below, Jay Baer turned a static white paper into an interactive SlideShare presentation. Repurpose your existing content into a new visual SlideShare presentation for additional exposure. This is a fantastic way to repurpose content and now have it hosted in multiple formats. Jay offers this content as an eBook and a SlideShare presentation, giving his audience a choice on how they prefer to consume the content. In addition, the SlideShare presentation is easily shared and embedded across the web for extra SEO juice. You can look at your existing content to repurpose into SlideShare presentations, and also remember to consider repurposing your SlideShare presentations into other forms of content. SlideShare has a fantastic analytics dashboard for its pro customers that shows some very helpful stats for each presentation you publish. If you’re planning on using SlideShare as part of your overall content marketing strategy, then a pro account is a great investment. 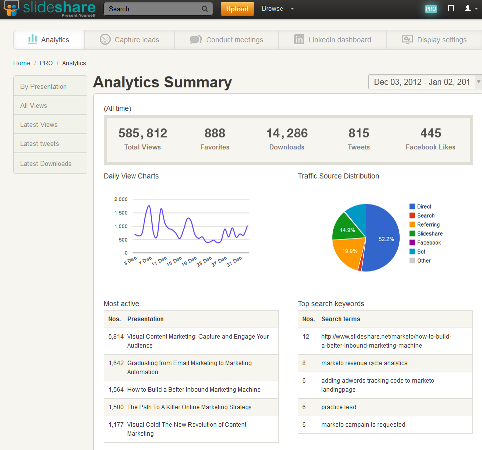 SlideShare’s analytics dashboard provides deep insights into your presentations. It’s essential to measure the key metrics around your presentations to see which ones are performing well. You can view the referring traffic, a breakdown of where the audience is coming from and much more. This type of info is vital for guiding the decision-making on what type of content to produce more of in the future. 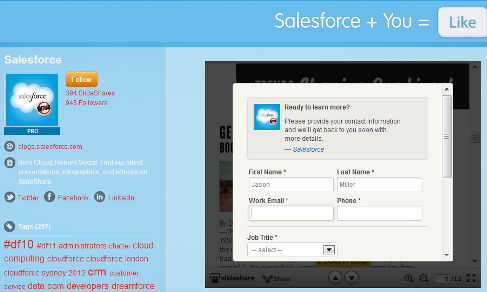 SlideShare has the ability to embed a lead generation form at the end of your presentation. 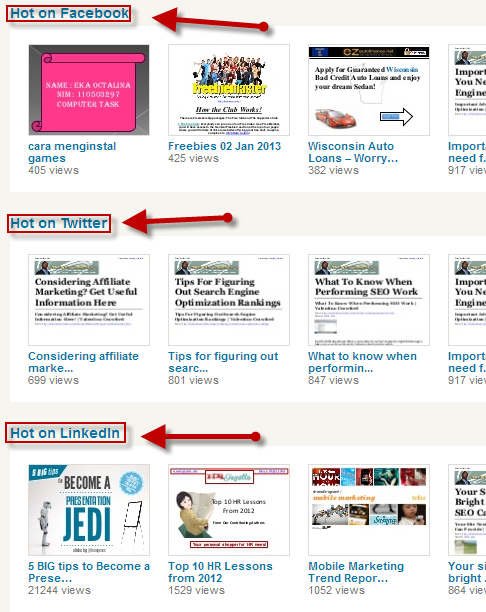 This is where SlideShare shines for lead generation. You have the option to have a form pop up after your presentation is complete into which users can enter their information to download the presentation and/or learn more about your company. Turn on the Lead Form option to turn your presentations into lead generating machines. You can then export these names and follow up accordingly. If you use a marketing automation platform, you can sync these names directly into your database and trigger alerts based on keywords that indicate the user is interested in buying. LinkedIn’s purchase of SlideShare last year was a brilliant move. In 2013, we will likely see many more integrated features. 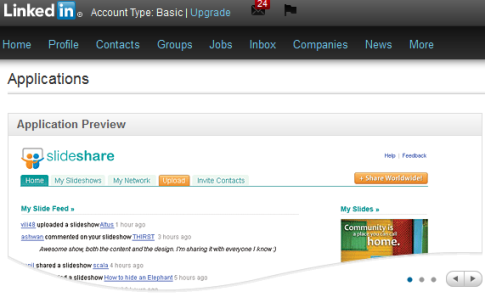 For now, you can easily embed your presentations on your personal LinkedIn profile for additional views and credibility. LinkedIn now allows you to embed presentations directly into your personal profile. With a bit of careful planning and cross-functional alignment of your goals, the results are tremendous. Visual is vital for breaking through the noise and reaching prospects and customers in today’s “attention economy.” Use SlideShare and implement the tactics mentioned above to both complement your static content and offer yet another way for your content to be consumed in a much more interactive and visually stimulating way. When you consider the rich analytics and SlideShare’s overall flexibility, you’ll understand why it’s a fantastic channel to pull in new leads, while nurturing the ones you already have. What do you think? 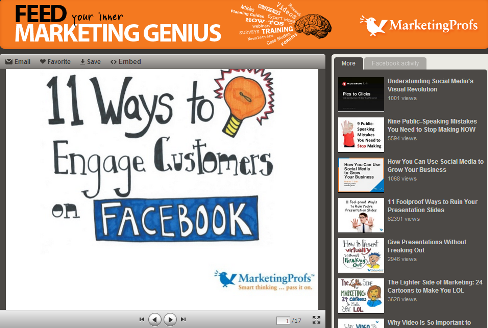 Are you using SlideShare in your lead generation efforts? Do you have any tactics to share? Please join the conversation in the comment section below.